Before I dive into this PicoBrew review, I first want to say that I have very fond memories of homemade beer. My friend’s family used to brew a batch once a month and, to this day, I remember the smell and the yellow frothy goodness gulped down by their and my folks nearly every weekend. As a youngster, the best part for me was at the same time we’d brew up some homemade root beer, which was the most delicious thing I’d ever tasted. I was never strong enough to get the caps on the reused bottles we used, but I could help with just about everything else. When I decided it was time to try my own hand at home-brewed beer, I was really lost. I got help, read blogs, asked questions, and still wasn’t getting anywhere. Then a friend suggested I look at PicoBrew. I have to admit I was sucked in by the hearty looking design with all the bells and whistles. The fact that it connected to wi-fi to assure the process matched the flavor and the brew was a feature that, honestly, got me hooked on checking it out. The PicoBrew Pico Automated Home Brewing Appliance really does all the work and thinking for you, and when I got everything out of the box I quickly realized I was over my skis again. The thick manual stared at me from the counter and I figured I better start reading. It wasn’t as nearly complicated as I had dreaded and once I got the initial cleaning out of the way, I was feeling pretty confident and got to work. I already knew what I wanted to try first, a stout called Buffalo Sweat by Tallgrass Brewing, and thank goodness the Pico packs have everything ready in pre-measured bliss for those of us who struggle with such things. 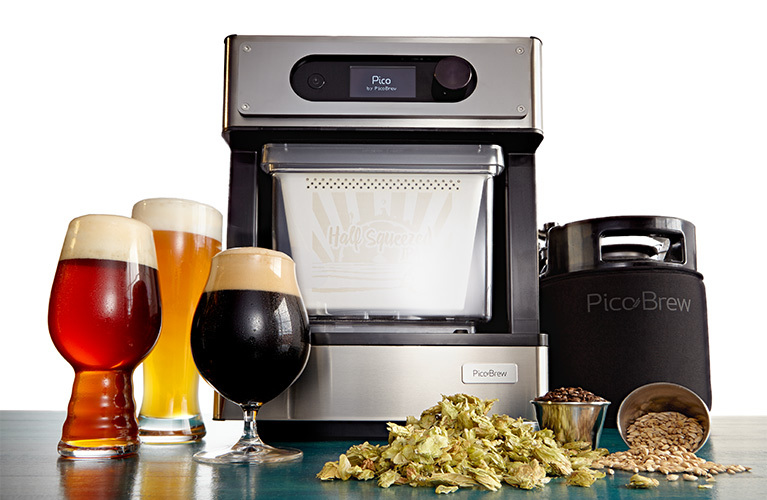 I had read a few times the PicoBrew Pico Automated Home Brewing Appliance was like the Keurig for beer, and at this point I agreed. I happen to own a Keurig and felt the same way when I first tasted my steam brewed coffee just the way I liked it. Though the PicoBrew Pico has more steps than Keurig, I no longer had to spend hours watching and monitoring the brewing process because my new machine could do that on its own. I took a break to let it do its thing and read more of the manual to get ahead of the game. It turns out I could speed up the process even more if I went with the option of a faster ferment. This would save up to three days in the process, and I immediately knew this was for me. I had planned a day of football and wings with some friends and would need their help emptying the serving keg. I was also able to choose bitterness level and alcohol preference. I went with less bitter and more alcohol, you know, for my friends. Ready to check it out for yourself? See the Selection of PicoBrew at Amazon Now! Once the brew is done, it’s not beer yet and needs to cool for a while before adding the yeast to let it ferment. I quickly decided, because it was getting late, to let the cool-off period take the night. I left it out on the counter and began the rather arduous cleaning process. It took me some time, but I am still thinking back to the home method I used and failed at, so the cleaning time still didn’t add up to the hours I had spent with no results. The next morning was time to add the yeast, and then the magic really starts. The raw liquid, called wort, begins making beer once the yeast is added. I was still sort of marveling at the process as I added the 5-liter keg to the fridge, and because of its size I had to clear out plenty of space. The PicoBrew Pico Automated Home Brewing Appliance offers a couple of options for adding the bubbly part of the homemade brew, one is adding sugar to the mix, or manually adding CO2 to the mix, forcing air into the mixture. At this point, it’s time to move the near beer from the brewing keg to the serving keg. I was getting pretty excited that my first batch would be ready soon and struggled a few times with the process of the move, but checked the manual one more time and quickly completed the step. I went with the CO2 addition to the keg, and into the refrigerator it went. The next cleaning step is a complete cleansing of the brew keg which took some time and patience, but my first batch was now completed and I began deciding during my KP duty what my next batch would be. With more than 40 PicoPak options, this would take some consideration and perhaps another planned party to start a taste-testing tradition. The elements I loved about the PicoBrew Pico Automated Home Brewing Appliance are precisely what drew me to it in the first place. Compared to my attempts at home brewing without any help, the Pico seems effortless. The high-tech features take much of the second guessing out the of the process with its wi-fi connection to the standard processing stored in Pico’s menu. I took the opportunity to “watch” the process of the brewing on Pico’s website and it was a great addition to my education on the whole time-saving process. My first batch was ready just in time for my friends who arrived with more than enough wings needing a wash down. We each took our first drink at the same time to get everyone’s opinion simultaneously. It was victorious. The common comment was that the Buffalo Sweat was sturdy and malty, with no bitter aftertaste nor too light to seem watered down. The 5-liter serving keg was empty before the wings were gone, and I then had plenty of help to start the next batch. This is badass. Buy it for yourself or as a gift – but definitely give this a try!